← Should I Spend Donuts on the Blasting Bass? Should I Spend Donuts on the Jay G Bundle or Black Leather Plane? Hope you’ve got your dancing shoes on and your cell phones ready to light up the night because Homerpalooza has arrived in Springfield! That’s right the hip hop fest has begun! Our stores are now jam-packed with premium items just tempting us to drop our sprinkles on! My Opinion On It Now: I know that I usually say 150 bucks is pricey for a one off character, but this one is a good deal. 150 donuts for a premium character, building, NPC AND bonus % earning decoration…well worth it. Good Buy if you have the donuts. What Does It Do? : Just a plane decoration…like the pop star plane, but looks different and costs donuts. My Opinion On It Now: Pass. What are your thoughts on the returning items? Which items do you have already? Which items will you be picking up? Sound off in the comments below, you know we love hearing from you! This entry was posted in Buildings, Characters, Decorations, Donuts, Should I Buy, Tapped Out, Tips and Tricks, Updates and tagged Homerpalooza Event, Opera Krusty, should i buy the black leather plane, should I buy the jay g bundle, Tapped Out Homerpalooza, Tapped Out Tips and Tricks, The Simpsons Tapped Out, TSTO Addicts, TSTO Homerpalooza Event, TSTO Music Event, TSTO Tips and Tricks. Bookmark the permalink. I bought it but can’t find the goose anywhere. Placed the house and pool, no goose. The ONLY reason I’m upset with Jay is that he doesn’t jam. 🤣 I got him during the Gil deal, and not even upset for “overpaying” then, he’s worth that much honestly. Those who waited or passed him over GET HIM NOW!!! So is the pool 2% or 2.25%? And does the house have a multiplier too? Had to move Fat Tony’s compound out of the Heights to fit this mansion, and with the pool I barely had space. We need more Heights, EA! This is a really nice deal but I’m going to have to pass. I’m already saving donuts for Halloween and there isn’t any space left in my Springfield Heights for this bundle. 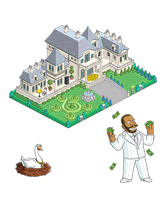 I bought Jay G and placed that big ol’ mansion of his, and then it told me the pool was in my inventory. Well, I clearly needed to pull that out for the bonus, right? So I grab it and go to place it… and it’s just as massive as the mansion! I just dropped it into some space I’d intentionally left open, but it looks like I’m going to need to rearrange a bunch of clutter in order to find a proper place place to put both his pool and his mansion! LOL! 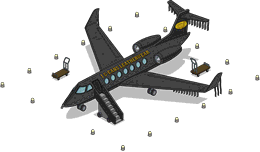 I had the black leather plane since the Destination Springfield event and since it was brought back for donuts, EA could of added a bonus to it. The Jay G bundle is a must buy for me because in the previous SIB post I said that I would get it when it returns again at a discount and I got the donuts to spare for this. I accidentally bought the bundle for Jay-G but I’m actually happy with it. It has given me a chance to make a cool design for it. Nah…. still too expensive for me. I am not a fan of Jay Z (What a silly nickname by the way) nor from Beyoncé so I pass on that one. Probably next year there will again be a mystery box where you can catch him for 65 or 75 donuts. And I nearly bought this for 225 donuts when it was first introduced. Glad I held off, instant buy this time. Not a fan of one-off characters from episodes I don’t even watch, but this looked like a good way to spend some donuts. Good rebate on a formerly overpriced Gil deal, nice bonus% included (worth about 30 donuts to me), detailed mansion, NPC which actually gets used in his visible 24hrs task. So added him, instead of Rachel Jordan (waiting for her to return with a rebate).